Wait… Did that title read… ethics? Yes. Ethics. Moral Philosophy. It’s a branch of philosophy that deals the concepts of right and wrong. What is right? What is wrong? Etc. The early greek philosophers like Socrates (469 BC – 399 BC) would talk about ethics. He encouraged people to look at “the condition of humankind” (quoting wikipedia not Socrates… because he spoke ancient greek). He saw knowledge about human life placed higher above all other knowledge. Self-knowledge was therefore needed for success, and therefore good. A self-aware person, thought Socrates, would within his or her own limits be able to succeed, whereas someone not self-aware would have failure. He also thought that people would naturally do the right thing, if they know it’s the right thing. He felt that evil or bad actions (like cheating) were the result of ignorance. If a crook were fully aware of all the mental, physical, and spiritual consequences of their actions, they would not commit their crimes. So in Socrates mind knowledge was correlated with virtue, and virtue was correlated with happiness. Um. Ok, so what’s that got to do with Foursquare? “Foursquare is meant to be a social utility that helps you connect with your friends and track your personal history” I normally write about analytics or usability issues, but today I’m busting out of my wheelhouse to talk about *gasp*… Social Media. Specifically Foursquare. Foursquare is a location based social networking website and app for mobile phones created in 2009. With the announcement on April 20th that Foursquare is planning on launching their first paid ad platform and the ongoing growth of Foursquare as a medium, it deserves some more attention. Users on Foursquare can “check in” at specific venues using the app on their phones, selecting from a list of nearby locations determined by GPS tracking on the phone. Every check-in awards the user points which they tally in a running list compared to their friends, as well as having the opportunity to earn “badges” for activities like eating at 5 mexican restaurants, or checking in with a large group of people at the same venue, as well as “mayorships” which means that in the past 60 days you’ve checked into that venue more often that anyone else. Users share their lives with their friends, and can further share their Foursquare check-ins on Facebook or Twitter. Add Tips to venues, create to do lists, comment on each others check-ins and more. 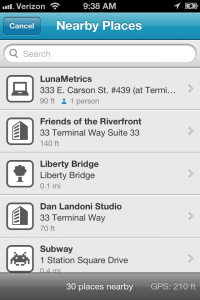 Some users use Foursquare to simply track their life. Others use it to find out where their friends are hanging out. Others are addicted to the game theory features working to gain badges, points, and mayorships. Others are attracted to the various deals offered. Each venue can register with Foursquare and award deals for check-ins, or mayorships. They can offer all sorts of specials and deals, free appetizers, or $5 off for using an American Express card. 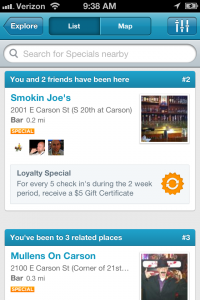 When a user goes to check in on Foursquare they can also see any of the specials at nearby locations. There are tons of ways that businesses can use Foursquare. Ok, so again… What. Does. That. Have. To. Do. With Foursquare? 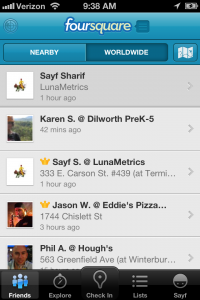 See, we have a bunch of dedicated Foursquare users here at LunaMetrics. We check in at work. We check in at lunch. We check in at happy hour. We’ve had discussions about when a check-in is appropriate. When is it legitimate? When is it ethical to check in somewhere? When are you cheating? How often can you check in? Where can you check in from? So what are the ethical rules then? 1. No Couch Check-Ins – You can cheat and check in anywhere from anywhere, but your check in only counts when you’re in close proximity (via your phone’s GPS) to the location. This is because the heart of Foursquare is actually physically BEING places. Don’t check in places you aren’t currently at, whether it’s a check in to the World Cup on another continent when you’re at home, or some cool music festival that has a special attendance badge you can earn. It’s lame. It’s against the nature of Foursquare. Don’t do it. 2. 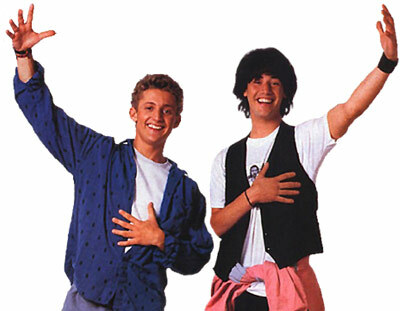 No Retroactive (Public) Check-Ins – Per rule 1… Oops did you forget to check in somewhere and now you’re home? Fine go ahead and check in for your own personal record if you really were there, but it has to be done as an “off the grid” check in so it’s private and doesn’t count towards mayorships and your friends won’t see it, but it’ll count towards badges. If you forgot, then you should remember next time shouldn’t you? 3. Don’t Check In to your Media Consumption – Don’t check into a baseball game on Foursquare when you’re watching it from home on television. You wouldn’t check into “King’s Landing” from “Game of Thrones” if you were watching it on HBO. There are other check in apps and sites for “media consumption” such as GetGlue and Miso. Use those when you watch a baseball game, or watch a tv show, rather than FourSquare. 4. Check in Once Per Day – It only counts once per day. Only check in a second time someplace if it’s meaningful and tied to a reasonably different event. Check ins only count once per Foursquare day (from 7am EST to the following 7am) so you can check in somewhere 100 times in a day and it doesn’t help your mayoral chances. So if you’re checking in again, it really needs to be meaningful. If you want to do it for your personal record then go for an “off the grid” check in. 5. No Drive By Check-Ins – Walking (or even literally driving) by a store or something? You can’t check in. So you have a mayorship at that restaurant and you don’t want to lose it, so even when you don’t go in you check in every day you walk by it? That’s not cool. That actually hurts Foursquare because it makes it hard for that restaurant to offer legitimate mayor deals. If you are just passing by somewhere you can’t check in. 6. Pop In Check-In – So you actually poke your head in the door. That doesn’t mean you can check in either. So you walk by that restaurant, so you walk in the front door, dance a jig for 30 seconds, and check in on Foursquare and leave? No, that’s not an ethical check in. You can’t just walk into a retail establishment or restaurant and check in. 7. Legitimate Use Check-In – You need to stay there for 10 minutes, or use the location for it’s purpose. So if you walk into a coffee shop, don’t buy anything, but talk to some for 10 minutes? Go ahead and check in. You go to a store and buy a pack of gum and leave in 1 minute? Go ahead and check in. You have to use the place for it’s purpose, or you have to stay 10 minutes. If you go in a store and find they don’t have what you want and leave inside the 10 minute window, that counts as using the place for it’s purpose. 8. Work Check-Ins – It depends on the place of business. If it’s an office where customers don’t directly visit, then you may check in and battle with your coworkers for mayorship. However if you are an employee at a retail store, or a restaurant you cannot check in at work. Even if you’re there more than 10 minutes per the above rule. If a workplace can legitimately offer customer specials for visiting their physical location, then you cannot ethically check in at work, because it is unfair to the actual customers. You’re hurting your place of business by checking in, and it wouldn’t surprise me if many businesses told their employees specifically that they couldn’t check in on Foursquare at work. 9. Places of Interest – There are plenty of places you can check in on Foursquare that are more locations. Statues in parks. Bridges. Etc. Use your best judgment. If you are simply walking by a park that has a statue in it, and you can see the statue, but you’re not actually walking up to it, then you shouldn’t check in at the statue. If you’re walking right by it and looking at it, even without stopping, then that could be argued for a check-in. For a bridge check-in you should cross, or at least be on, or under the bridge. Points of interest again are physical locations. If you are on a boat that goes around Liberty Island but does not dock, should you check-in at the Statue of Liberty? I would argue no. The check-in there would indicate that you are literally AT the Statue of Liberty. But for landmarks there is definite wiggle room. Should you check in at Mount Rushmore when you’re at the observation deck even if it’s pretty far away from the actual Mount Rushmore? Yes. Again. Use your best judgment. 10. Home Check-Ins – Many people feel home check-ins are gauche, but if you wish to do so, go for it. However NEVER create a venue for someone else’s home that you are visiting, and if you do check in at home, make sure it’s private. 11. North Pole – Don’t create venues that don’t exist, just to check in there. Come on, don’t be that guy. 12. Sharing – Don’t socially share every single check-in you make. That’s spam, and it irritates people. Share only what’s meaningful. Say you work at an office place that you CAN check into, and do so on a daily basis. Don’t share that to your Twitter or Facebook feed regularly. But if there is some story attached to the check-in then go for sharing “Got to work today to find out that we’re going on a day long company booze cruise! Sweet!” Also don’t friend everyone in the world on Foursquare like you would on Facebook. Just people you really trust, cause they’re gonna know when you’re away from home. And don’t forget to make use of the “off the grid” check in for extra privacy. 13. Time Travel – Is it ethical to check in on foursquare in ancient greece while time traveling? The answer? Yes… however the lack of a GPS signal will prevent you from becoming mayor. So that’s it. It’s not hard. 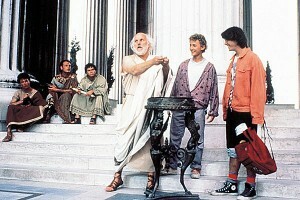 Now that you know the rules, at least according to the way Socrates thinks you won’t cheat! I know better of course. But now when you cheat at least maybe, somewhere, in that dark evil heart of yours you’ll feel guilty. Just a little bit.